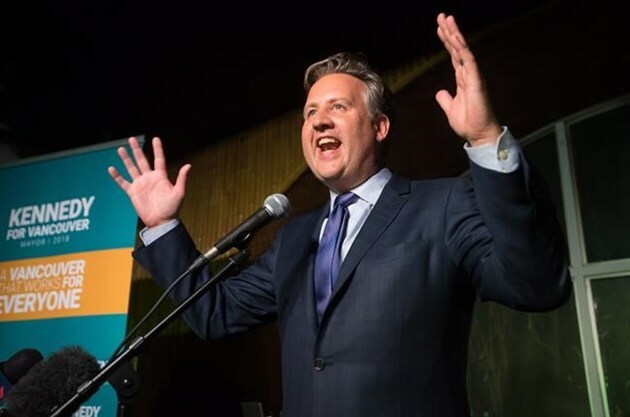 New mayor Kennedy Stewart will focus on increasing support for arts and culture “to build a Vancouver that works for everyone, to make life better for everyone.” | Image: GlobalTV via Facebook. When the newly elected independent mayor Kennedy Stewart took to the podium on election night to share his very first words as Vancouver’s new leader, he immediately promised to focus on five concerns. One of those issues is support for arts and culture, which he highlighted not once, but twice in his brief victory speech. Soon after final BC municipal election results were announced on Oct. 21, the mayor-elect told a boisterous crowd at The Waldorf, in East Vancouver, that his work will be “about building a Vancouver that works for everyone. This whole campaign has been about addressing the challenges that face this city: The opioid crisis, lack of transit options, small businesses and how they’re struggling, and the lack of support for arts and culture.” Stewart then outlined plans to fix Vancouver’s housing affordability issue, which culminated with more appreciation for creativity—the mayor imagining a city, whose inhabitants “can share stories with each other…about music and art and movies,” rather than always talking about the high cost of housing. In his election platform, Stewart, who participated in the BC Alliance’s over-capacity All Candidates Meeting for Arts And Culture and in our All Candidates Survey for Arts and Culture, promises to “expand arts grants,” and “build 100,000 [square feet] of affordable studio space over the next decade”—the two main tenets of BC Alliance’s municipal election advocacy. Stewart isn’t the only new mayor who knows arts and culture are critical for thriving cities. Kelowna mayor elect Colin Basran’s arts and culture platform supports the city’s “world class talent.” Victoria mayor Lisa Helps was re-elected for promising to “secure funding for the Bastion Square Creative Hub for artists, makers, and innovators." Whistler mayor elect Jack Crompton ran on a strong culture platform, as did re-elected Abbotsford mayor Henry Braun.